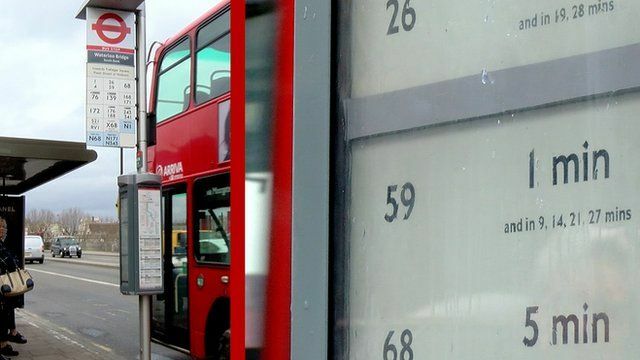 London bus stops embrace e-paper Jump to media player Transport for London trials e-paper bus stops that can display travel information in real-time using solar power. Work starts on city bus scheme Jump to media player Work has started on a £190m Metrobus scheme in Bristol, as part of the city's status as European Green Capital. Singers surprise Londoners on bus Jump to media player Four professional singers interpret their journey on a London bus guerrilla-style to the surprise of passengers. New bus stop built in a cycle lane Jump to media player Footage shows a new bus stop being built in the middle of a cycle lane in Glasgow, Scotland. Road swallows up bus in Brazil Jump to media player A bus has been swept away by flood waters after it fell into a river in the tropical Para state in Brazil. Four bus stops have been fitted with the tech so far. Chris Foxx quizzed TfL's head of technology Simon Reed about the innovation.